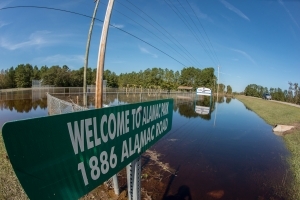 Alamance Community Park, in Robeson County, near Lumberton, NC, remained inundated with flood waters on Oct. 16, 2016. USDA Photo by Lance Cheung. As the state prepares for the imminent Hurricane Florence, let’s not forget those who are still facing the impacts from the catastrophic aftermath of Hurricane Matthew. On Oct. 8, 2016, Hurricane Matthew hit North Carolina, resulting in major flooding and property damage that affected more than 50 counties. With $2.8 billion in damages and $2 billion in economic impairment, the storm resulted in an estimated loss of 800,000 homes, 300,000 businesses, the displacement of 3,744 residents, and closures in 34 school systems. As of October 2017, a year after Matthew hit eastern North Carolina, the state had received $396 million in federal recovery funding and about $385 million in state recovery funding — leaving $450-$500 million in unmet needs for affected North Carolina communities. As we near the two-year mark, life for many in eastern North Carolina has not returned back to normal, and this impending storm will serve an even bigger blow to their livelihoods. North Carolina has historically not invested enough to ensure all North Carolinians have the ability to thrive. Although our policy makers set aside a Rainy Day Fund to assist in times of disaster, the aftermath of Hurricane Matthew made it clear they are not willing to adequately disperse the savings when our communities need it most. In learning from past mistakes, we need to push for policy makers to make wiser infrastructure investments in our schools, roads, and other public services and programs. We need to also ensure they begin to develop a comprehensive approach to protection, management, and preparedness during times of disaster that aid in the immediate and long term needs of our communities. As Hurricane Florence approaches, we must remind ourselves of the importance of working together to ensure our lawmakers are committed to the overall goal of making a more equitable North Carolina. Chanae Wilson is an Engagement Coordinator with the Budget & Tax Center, a project of the NC Justice Center.